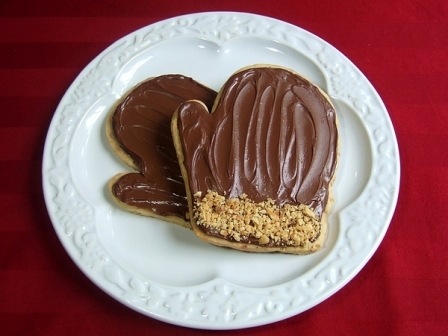 The hazelnut chocolate spread Nutella makes an easy and delicious frosting for these cookies. You can find it near the peanut butter in most supermarkets. If you want something that sets up a little firmer, use ganache, flavored with Frangelico, if you like. Set aside 1/4 cup ground nuts for decorating. Wrap dough in plastic wrap and chill until firm. (If refrigerated for more than 1 hour, let dough soften on counter 20 minutes before rolling out.) Preheat oven to 350 degrees. Roll dough out on a lightly floured counter to 1/4 inch thickness and cut, then transfer cookies onto cookie sheets that have been lined with parchment paper or silicone liners. Bake 8 to 10 minutes, until just barely browned around the edges. Let cookies cool slightly on cookie sheets, then transfer to a wire rack to cool completely. Frost with [ganache link to ganache recipe] or Nutella, and decorate with reserved hazelnuts, if desired. Toasting notes: Place the nuts on a rimmed baking sheet in a 300 degree oven for 10 to 15 minutes, until golden brown (check any broken nuts to gauge the color) and fragrant. You can do this in a regular oven or a toaster oven; either way, watch them carefully so they don't burn. Just before removing the nuts from the oven, lay a large kitchen towel on the counter. Carefully pour the hazelnuts onto the center of the towel, then wrap the towel around the nuts and let sit for 10 minutes or so. To remove the skins, rub the hazelnuts inside the towel, using your hands to pinch them. It's OK if a few skins remain. Open up the towel, hold a platter or baking sheet just below the countertop, and use your other hand to roll the nuts off the towel and onto the platter, leaving the skins behind.